One of the coolest trends to hit the polymer clay community in recent years is silkscreens. They allow you to create your own printed “fabric” of clay and are a really neat way to make a design that can then be used in your projects in an infinite number of ways. You might have seen the Sculpey Silkscreen Kit in craft stores or noticed one of the fantastic silkscreen artists producing unique artisan designs. And while the basic principle is simple, there’s really quite a bit to know about using silkscreens on polymer clay. There’s so much to know, in fact, that I realized there was just too much to put into an article here on this website. I started writing and it blossomed to 30 pages before I was done. And it includes 55 photographs that I took while working with silkscreens. Yeah. A website article wasn’t going to work. Isn’t it funny how little ideas turn to bigger ideas that quickly get out of hand? Well next thing you know I’d planned an entire series of Knowledge Base eBooks to offer in addition to my not-exactly-small tutorials. Silkscreens are just the beginning, but for now, let me announce release of my All About Silkscreens on Polymer Clay eBook. I spent several weeks trying everything I could think of with silkscreens on polymer clay. I used runny paints, thick paints, mica powders, PanPastels, chalks, inks, and mediums. I ruined silkscreens. I bugged the silkscreen makers asking for advice and suggestions. I tried products, and most of all I had fun. Because let me assure you, using silkscreens is fun. Ultimately, the All About Silkscreens on Polymer Clay ebook, by the time I added all the pictures and formatted it, was over 30 pages. Of course there’s a table of contents. Plus a resources section giving you even more information. And there’s a gallery section where I tell you exactly what silkscreens, paints, and processes I used to get the samples that you will see in the photos. 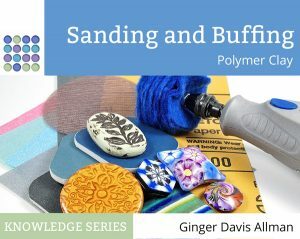 While I do take you through the steps, in detail, of how to make a silkscreen print on polymer clay, I don’t include a project in this ebook as it’s designed to be an informational work and part of my new Knowledge Base series. But don’t worry, there’s still plenty of colorful fun to be had as I’ve also released a new project tutorial. After you learn about silkscreens, you’ll be eager to make a project with them. The Opulent Tapestry Tutorial is an easy project tutorial that takes you through every step of making a richly colored, silkscreened pair of earrings. Perfect for when you don’t have a lot of time and want to have a satisfying, completed project, the 42 steps of this tutorial don’t leave you hanging and wondering what to do next. The clear pictures and text make the process very easy, from start to finish. And you’ll learn lots of little tips along the way, too. The Opulent Tapestry Tutorial shows how to make a pair of earrings, but there are also pointers explaining how to make pendants or a brooch instead. The basic design could be used in lots of ways beyond jewelry, too. Your imagination can take this so many ways. You may have already seen, or even may have purchased, the Sculpey Silkscreen kit. While it’s a really neat little kit and has a lot of silkscreens to play with, it’s just the beginning. There are several artisan silkscreen makers around the world who use their own designs to hand-make silkscreens for their customers. These silkscreen artisans have distinctive designs and bring an incredible variety to the marketplace. Malgorzata Wawrzynczak makes the most wonderful crisply detailed silkscreens in all kinds of designs. There are op-art designs, art deco, art nouveau, mandalas, texture-type backgounds, and even whimsical cartoon styles. You’re sure to find one you like. You can buy them through her Etsy shop or from your favorite clay supplier such as Clayaround in the UK and 2Wards Polymer Clay in Australia. Alison and Paul Gallant are based in England and they sell their screens through their own website, their Etsy shop, and through suppliers such as Clayaround, 2Wards Polymer Clay, Happy Things, and PolymerClay.de. Helen Breil is a well-known polymer clay artist and teacher who has a small line of silkscreens made in her very distinctive designs. These are really nicely made silkscreens with each one being a uniform size and I love that the name of the design is included at the edge of each silkscreen. You can find Helen’s silkscreens in many online shops including PolyClayPlay, ClayAround, 2Wards Polymer Clay, and HappyThings. Tonja Lenderman has a HUGE array of silkscreens, many of which coordinate with her equally huge line of clear texture stamps. You can find her screens in her Etsy and Zibbet shops. Tina Holden is a Canadian silkscreen artisan who also sells a really impressive line of tutorials. So do make sure that you check them out as well. Several of them do use silkscreens. Tina’s Paisley silkscreen is the one that I used to illustrate the project in the Opulent Tapestry Tutorial. You can find Tina’s silkscreens and tutorials in her Artfire and Zibbet shops. Ilysa Ginsburg and Kyra Slye of Polymer Clay TV fame have their own supply shop where you can get their line of silkscreens. Here are some of my well-used silkscreens that I tested and played with while writing the All About Silkscreens eBook and the Opulent Tapestry Tutorial. Ooh, this might have to be a Merry Christmas to me present. 🙂 I know they will both be fabulous and full of inspiring information. Thank you Tammy. I hope you’re enjoying them. I look forward to seeing silkscreeny goodness coming….perhaps some Paisley Lizard brooches??? Really thorough and clear. These contain a plethora of information that I would NEVER have wanted to research. Well done Ginger. This is a wealth of information at my fingertips, and all for $15. Great job and thank you! Thank you for the testimonial! I’m so glad that you’re enjoying them! I greatly enjoyed both the ebook & tutorial! Ordered some silkscreens and finally had time to do some experimenting. The detailed information let me get started with a much greater degree of confidence 🙂 So many possibilities! It is hard to be patient and let each step dry, but the results are definitely worth it. I’ve had good luck with acrylic paints, some luck with pan pastels, and liked using Jacquard’s permanent gold resist (which is water based & rinses out). Thanks so much for such clear instructions & tips! Thank you so much. I’m glad that you enjoyed it!